You’ve heard the “rules”: 1) Start sentences with capital letters. 2) Never start a sentence with a conjunction. 3) End sentences with a period, question mark, or exclamation point. 4) Never end a sentence with a preposition, etc. 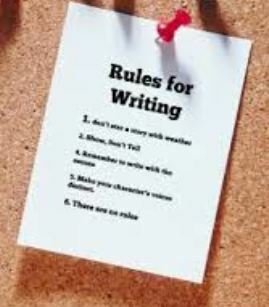 But some of these rules aren’t actual writing rules? For some reason, someone made up several of these. Following are some “rules” you can skip. Go ahead, start some sentences with a conjunction. There’s no reason why you can’t use a coordinating conjunction (and, or, nor, but, for, so, yet) to connect one sentence to the previous one. And there’s a whole host of subordinating conjunctions (e.g., after, if, when, until, because, while) that you can use to start a sentence. which sounds much better to the ear. There’s certainly appropriate formality in some writing, but using stilted phrases in order to adhere to a non-existent rule is ineffective. So, don’t worry about ending a sentence with a preposition, unless that preposition is unnecessary (e.g., Where’s is at?). An infinitive usually begins with to and is followed by the simple form of the verb (e.g., to be, to go). In appropriate situations, it’s okay to split an infinitive (e.g., To deliberately split an infinitive is correct and acceptable English.). In an anecdote, a youngster was asked to read some lines in a school play. One of the sentences involved splitting an infinitive. He was really concerned because he had infinity and atom splitting in mind and thought the worst would happen. Bottom line: Separating to from the verb is another tool for constructing creative phrases and sentences. A serial comma is a comma placed immediately before a coordinating conjunction (e.g., and, or, nor) in a series of three or more terms. Using it is up to the author and “rules” of his or her publisher. And British English and American English differ usage. Here’s an example: Jane had a number of cookie recipes: butter, sugar and chocolate chip and coconut. Without a serial comma, a reader doesn’t know whether the last recipe is a combination of peanut butter and chocolate chip or a combination of chocolate chip and coconut. To make the meaning clear, the writer would have to insert a comma either after peanut butter or after chocolate chip. Or maybe even better, just rewrite the sentence to avoid the confusion. So, while a serial comma isn’t always necessary, it often adds clarity. And if there’s any doubt about whether to use one, and unless written space is extremely expensive, it’s probably better to err on the side of using it. One thing though: It’s usage should be consistent. Right. Like writers don’t do this a lot. And to good effect. It’s not always necessary to write complete sentences. However, the sentence fragments need to make sense. While there are real rules you need to learn and follow, the ones above are not some of them. But don’t let non-rules limit your writing.